The Dalai Lama said education was a key factor in bringing peace and happiness in the world. Tibetan spiritual leader the Dalai Lama on Monday called upon the people to formulate a modern education system which could teach students ways to deal with destructive emotions and transform the world into an abode of peace and happiness. Addressing students and teachers at the DAV Centenary Public School in Meerut on the introduction of the curriculum of ‘Universal Ethics for Universal Responsibility’ in nine schools, the Dalai Lama said education was a key factor in bringing peace and happiness in the world. “India has a tradition of over 3,000 years in dealing with destructive thoughts,” he said. “Generations suffer after wars. More than 200 million people have died in wars and violence in the world. It is our responsibility that we do not allow any kind of violence,” the spiritual leader said. Disclosing that Nagarjuna, the great scholar of south India, and Mahatma Gandhi were his role models, the Dalai Lama said education should teach students the importance of peace of mind. Responding to a question why China was after the ‘Messenger of Peace’, the Dalai Lama said people were not aware about their struggle because of censorship in China. He said recently over a thousand articles were written in China in support of their cause and keeping culture and tradition of Tibet intact. “I am the Dalai Lama of Tibet, not China. I will continue to express my thoughts as a free spokesperson of Tibet,” he said. AyurGyan Foundation and DAV sSchool management have joined hands to teach the students universal ethics based on life’s basic elements of virtue, compassion and discernment so that they can learn how to deal with negative emotions. The Dalai Lama distributed books to students of nine schools and interacted with them. 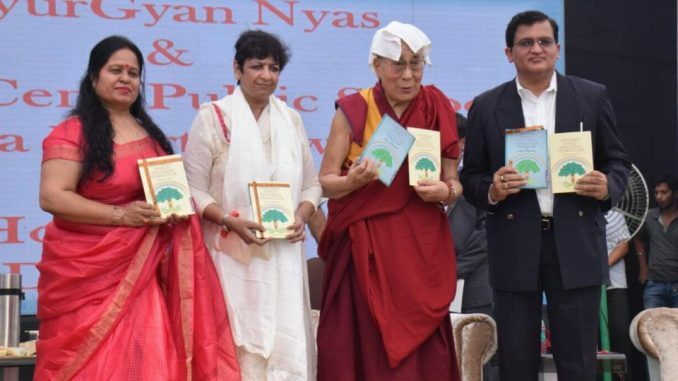 Principal of DAV Public School, Dr Alpna Sharma presented a tulsi sapling and the four Vedas to the Dalai Lama.